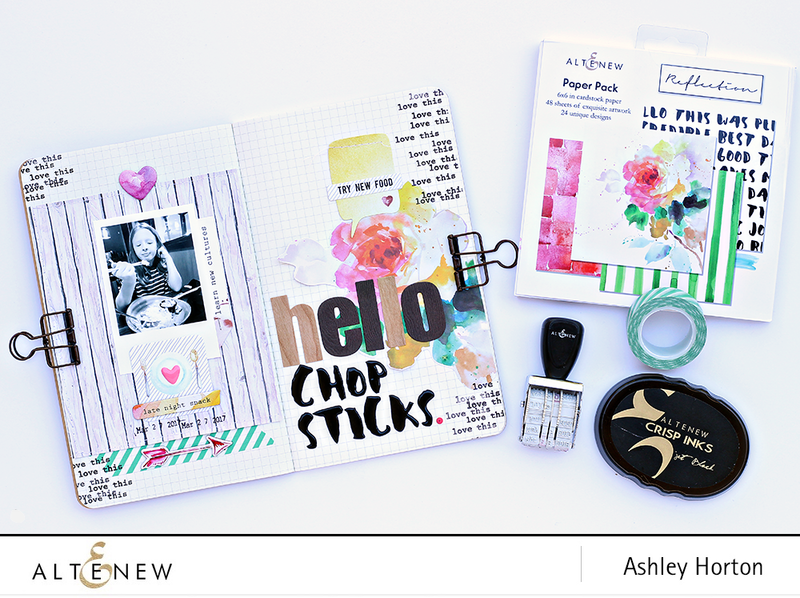 Ashley Horton Designs: Altenew’s 3rd Anniversary Blog Hop + Giveaway! Welcome to the Altenew 3rd Anniversary Blog Hop! There are four awesome days of inspiration and giveaways, that you won't want to miss! You can follow the links below, to check out the Blog posts that will go up each day. Now, it's time to share my project with you! 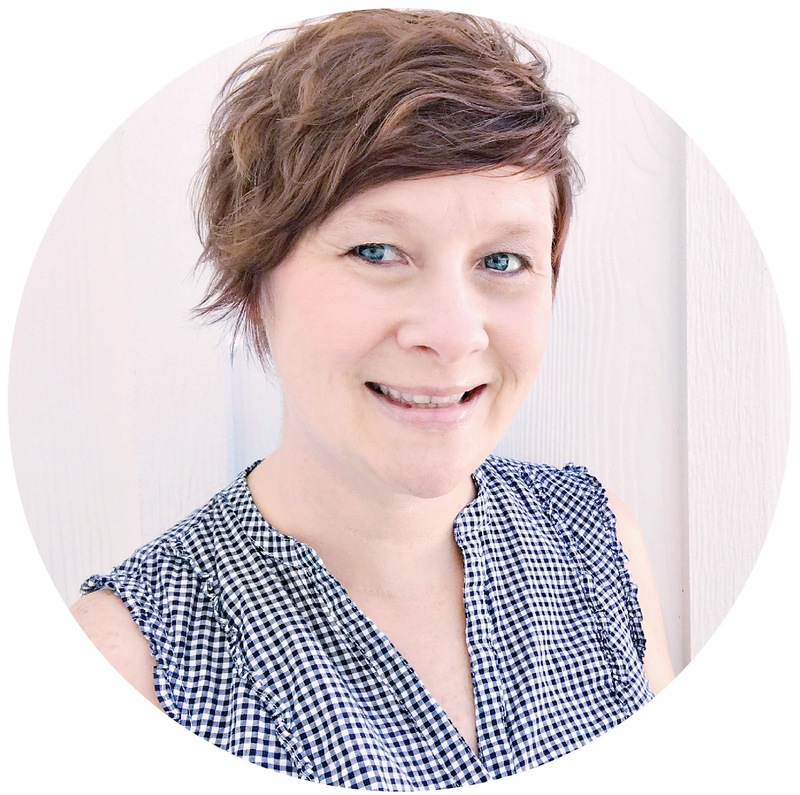 You should have arrived here, from the talented Laura Bassen's Blog. I used the Reflection Scrapbook collection to create a spread in my Traveler's Notebook. I love that all of the Altenew products can be used for any type of project, whether you are a scrapbooker or cardmaker! Here's a look at my best projects for Altenew! beautiful and creative, as always!!! SOOO beautiful! LOVE the gorgeous layers on your layouts, and the happy colors! Wonderful layout! However, I, simply, LOVE the expression on her face!! Love all the layouts. Very colorful and happy. Nicely done! I loved the mix of fonts and modern look of your pages ! I love your scrapbook layouts! Altenew is so fabulous! Absolutely AWESOME projects! I especially love your layout with the circle for Lovely Day page! Ashley, I love these projects you have created! My goal this summer is to catch up on my scrapbooking. This really inspires me! Really love the new products! Your layout is beautiful! Such a great idea to use the materials in your journal! Beautiful layout. Awesome layout. Thanks for sharing. I scrapbook as well and I love seeing other's ideas. Great layouts! The colors are so cheerful. Impressive pages. Thanks for sharing. Your notebook and projects just Rock! Love the Color! Great inspiration for those of us who are tempted to try scrapbooking - thank you! Love your projects, especially the scrapbook pages! That traveler's notebook is fun and a great way to use products as well. Thanks for sharing on this amazing blog hop!! I love all your happy colors. Love all the texture you created on your layouts. Well Done! Impressive layouts. They are great. Great layouts and ideas for use of Altenew products. Love the layouts and the colors you used. Fun designs with lots of inspiration! Great projects. You can tee how much you love crafting. Your projects are proof that Altenew products are great and very versatile. Wonderful layouts and love the colors! Very pretty! Great pages! Done with lots of love. What a happy looking and fun entry into a travel journey. Beautiful pages! It's fun seeing these products used as layouts! gorgeous layouts :) love the pretty layers and details. Thanks for sharing. You inspire me to start my layouts again, thank you! Your scrapbook oages are fabulous! What a neat way to use your stamps and colring media. Really innovative! Beautiful layout! Happy Anniversary, Altenew! I love the freedom you express in your layouts. They are vibrant and charming. Altenew has products for every occasion and style. Love it! Love your layout! Happy Anniversary Altenew! What a fun layout! Happy Anniversary Altenew! 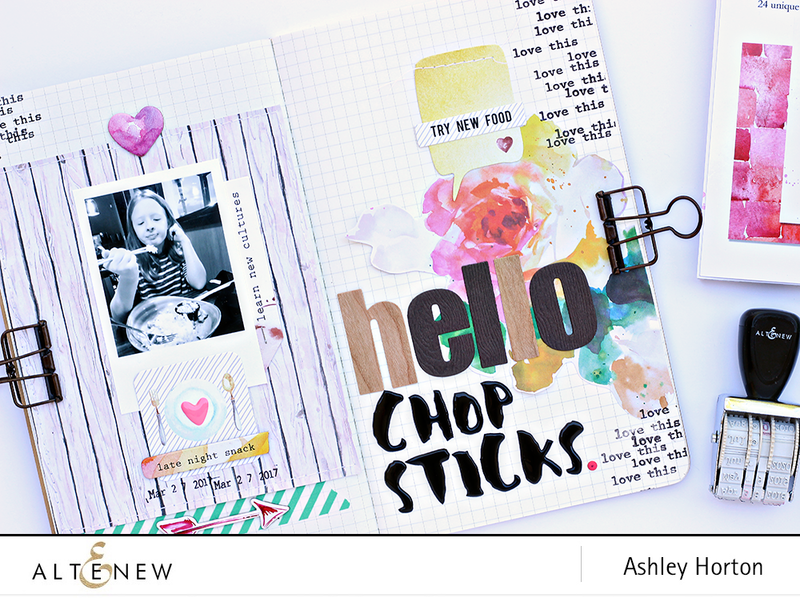 BEAUTIFUL layouts in SCRUMPTIOUS colors Ashley! Great page, so interesting with all the elements. Great products and layout. Thanks for sharing. These are fun and BEAUTIFUL! What a bright & colorful layout! Great layout documenting a fun experience! Wonderful layout design and I love the bright colors on it. great projects, love the colors! Your planner and your layout are super adorable! Love your layouts!!! I really like all the colors on all your pages and products. Happy Anniversary Altenew! Awesome job! Love your use of the pattern papers :) Have a great week! 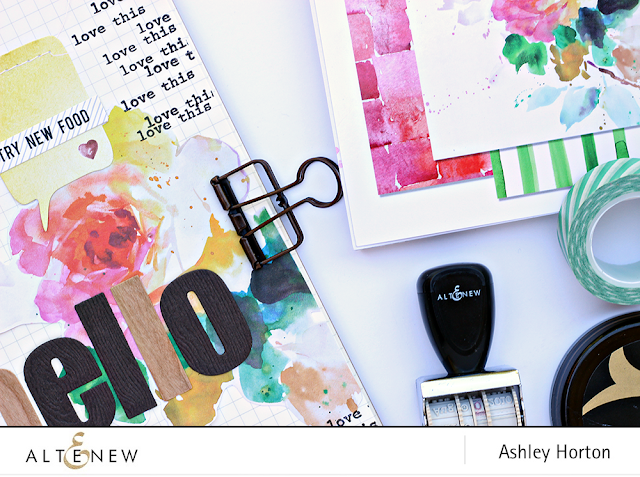 The mixed media look is very popular and I like the way you used the journaling on the sides of the layout. Very cute! Wonderful projects using Altenew products! The layouts are beautiful and fun. Love that paper pack, too! FUN & FAB! Great layouts! Beautiful pages!!! Soo bright and cheery!! These layouts are amazing! Well done. So many wonderful ideas here. I love the layout even though I am a card maker at heart. Yay, Altenew for having a birthday blog hop. Happy, happy and many more! Even though I am not a scrapbooker, I enjoy looking at what you do. Card making is my thing and Altenew has such wonderful stamps and dies to choose from. Happy 3rd Birthday. Ashley, your projects are all great, I especially love your traveler's notebook. (I am NOT much of a traveler but we are going away this summer for a few days and I know how everyday in a new place gets...I forget details! LOL) So I am going to make one of these in advance to write in while I am away to keep track of our adventures! I too love the versatility of Altenew's products! your layouts are so nice. I love the idea of doing this in a travel journal. wonderful colors. Love the dual use of these products...scrapbooking and cardmaking! Your colour choices are simply beautiful!!! Beautiful pages. Love the pic. I also love to try new food. I love your projrct with vibrant colors!!! Your layouts are so fun and colorful. Nice job! Ashley, LOVE your pages. Just got the Altenew scrapbooking kit and it is amazing. Thanks for all the fun inspiration. Great layouts. I especially loke the circular one with the triangles. Wonderful layouts! I've really got to get back to working on my scrapbooks now that I have new products and fresh ideas to use! Thank you for sharing. Your layouts ROCK!! I need to start scrapbooking again!! I miss it! I love your gorgeous scrapbook pages!! They really show off the Altenew products, and your artistic talent! 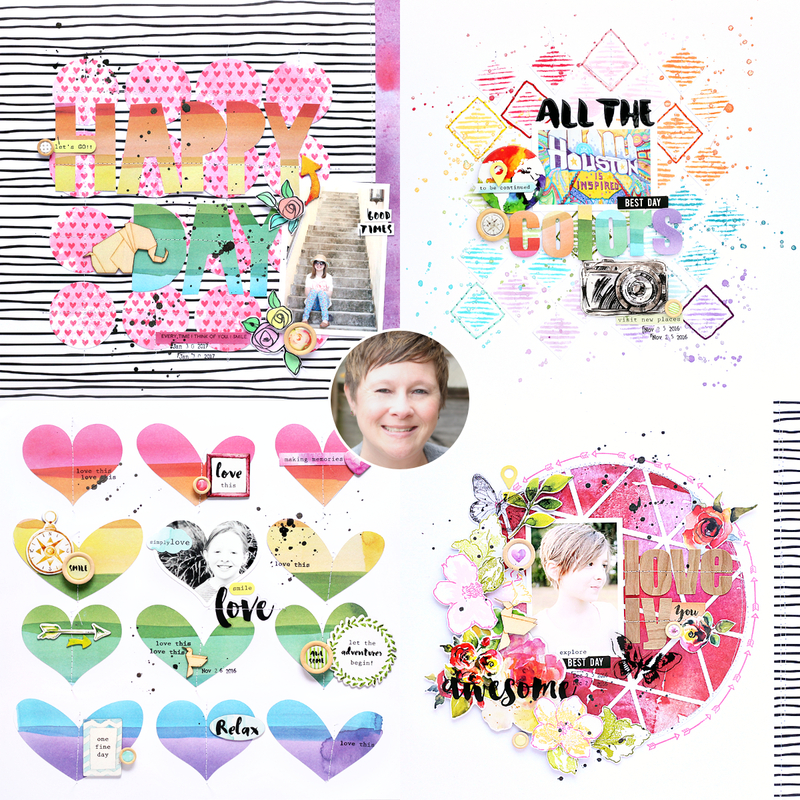 your layouts are so fun and creative - love your one done with the reflections kit! Fun and beautiful work, those colors are happy colors, it put a smile on my face! These are such great pages. Thanks for the inspiration! Love your journal!!! The size and layout with cute Polaroid inspired me to make a cute baby journal that can slip easily in baby bag for a friend whose expecting! I'm going to pair with a Polaroid camera and give as baby gift ! Love all the color you use. Beautiful and creative layouts!! Amazing way to showcase Altenew's fabulous products!! Super cute, creative projects, I too love using my stamping supplies on scrapbook layouts! Unique projects!! Love all the colors. Thanks for sharing! Great pages covering a funny subject with kids-new food! Your layouts are beautiful, creative and colorful. Love all. All your projects are so beautifully crafted!! I love looking at scrapbook projects, but have been wary of how well I would be able to layer the elements. Your layouts are inspiring though...should try again! I also love Altenew products. Thanks for inspiration for scrapbook projects. I'm mostly a card maker, but I'm about to start a scrapbook for my new grandson and you've given me a couple of great ideas. Wow ! !, fabulous job, it's awesome. Many thanks for the inspiration !! Love your layout, journal and scrapbook pages are so amazing. Great spread! Loving all the colors! I'm not into scrapbooking, but your work inspires me in my cardmaking! I love your style and layouts! Such a cute layout! 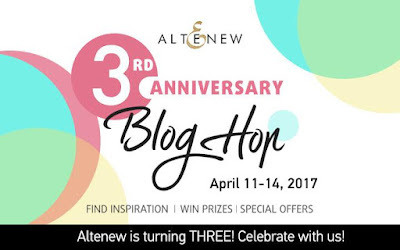 Thank you for sharing ^_^ I found your blog through the Altenew 3 year anniversary blog hop; I'm off to explore more of your projects! I'm not a scrapbooker or a journaler, but I do admire your sense of design and use of color and pattern! Soooo cute! Makes me want to get back to my scrapping!!! Love your layout and fresh, bright colors. Just what I needed for inspiration on this rainy day in Dallas! The layout splashes with color and is really captivating to look at. Love the way you use color to make your projects so unique. Thanks for sharing your creative ideas. I like ALL of your colorful, happy pages! I love your style! It's that perfect mix of simple and messy! I do both scrapbooking and card making and agree that it great to be able to use the products for either. 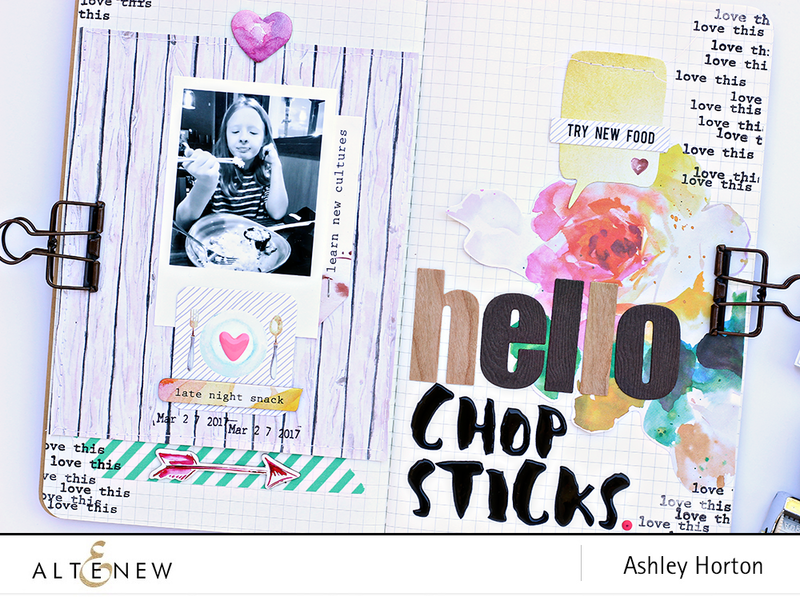 I love the LO of your traveler's notebook how it looks like your daughter is looking at the chopsticks like how am I going to eat with these...lol and I love how versatile Altenew stamps are. Gorgeous layouts and journal pages! Love the colors and layers. Great layouts - love the bright, happy colors. Lovely layouts! I agree! The versatility of these stamps for use on any crafty project is great! this is about the prettiest travelers notebook I have seen-fantastic! Like your bright, fun layouts. Happy anniversary Altenew, hope you have many many more. The traveler's notebook pages are so beautiful. Love your style. What a nice layout. Thanks for the inspiration. Love the way you framed the picture of the young girl! Thank you for the ideas. Love the TN size and Reflection is my favorite collection.....beautiful spread. thank you! So much fun to see the stamps used in a traveler's notebook! Inspiration...that's for sure! Thanks for sharing. Looks like you had so much fun making these beautiful pages! Love this hop! 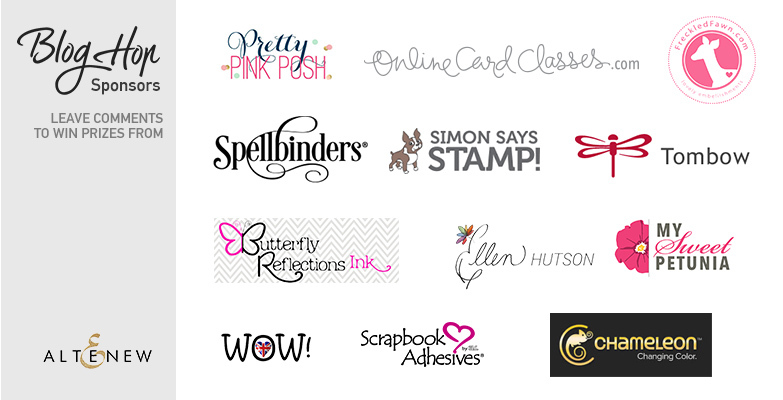 Love all these wonderful companies! Wow, what an amazing giveaway!! I LOVE your TNspread!! So pretty! I LOVE LOVE LOVE your projects! Such beautiful colors! Your colorful layout is just awesome. Great layouts. . .Thanks from another scrapbooker who is always looking for fresh ideas. And I really love the happy colors you use in your gorgeous layouts. Such wonderful colors on your page. Just love it. Wow! How nice to see a project that isn't a card!! Great projects! This layout in your TN is just so beautiful!! Inspires me Altenew products in my memory keeping as well. And all your layouts are stunning, as always. Thanks for sharing! Wonderful!! Your projects are astounding and love the layouts!! Great layout, so bright and cheerful! Ashley, I too like to mix my supplies between scrapbooking and card making. Nice layout. I already loved their stamps, now I want to get my hands on some of that paper, too. Love what you did with it! Thank you. Such an interesting and unique layout! Beautiful! FOUR whole days of celebration!? Yikes. Better get my party hat out. Lovely layouts! Beautiful layout! Yeah for the blog hop! Super cute layouts!! Love the the colors and designs you used!! So creative. Love all the bright colors. Filled with creativity, great inspiration ! Thanks for sharing. I love your bright and colorful scrapbook pages They really are happy! Love the bright colors. Another great inspirational idea to using Altenew products. Thanks for sharing!